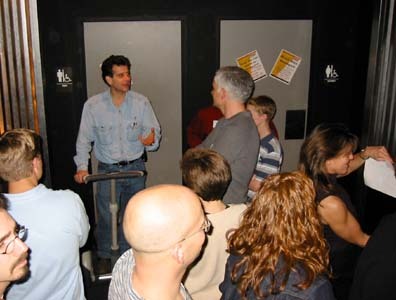 We attended a talk given by Dean Kamen about his most recent invention, the Segway human transport vehicle, his other inventions and a program called FIRST "For Inspiration and Recognition of Science and Technology" among middle and high school students. Dean is an interesting guy whose inventions have changed many lives for the better. Learning about his accomplishments and passion for science was inspiring, but riding a Segway was just plain fun! 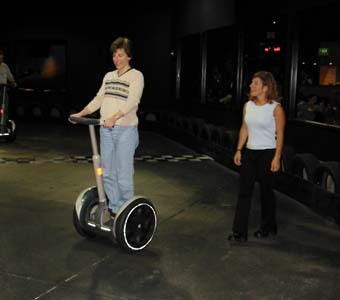 It was very easy and quick to learn the basics of how to drive a Segway. In 30 seconds we were going forward, stopping, reversing and turning. It would take some practice to get really comfortable in a crowded environment, but they are remarkably small and agile. Dean talks, Cathy and others listen. 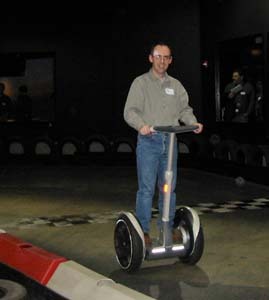 Dean fidgets on his Segway while surrounded by the teeming masses. Clearly he's pretty comfortable on the Segway, even in crowded conditions. 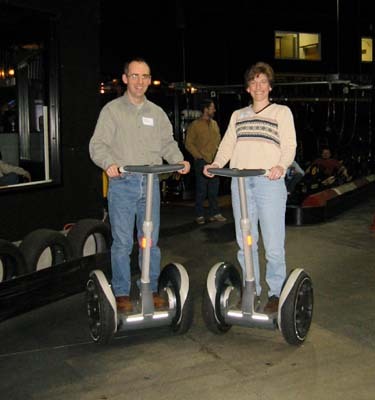 They pose in dueling Segways.